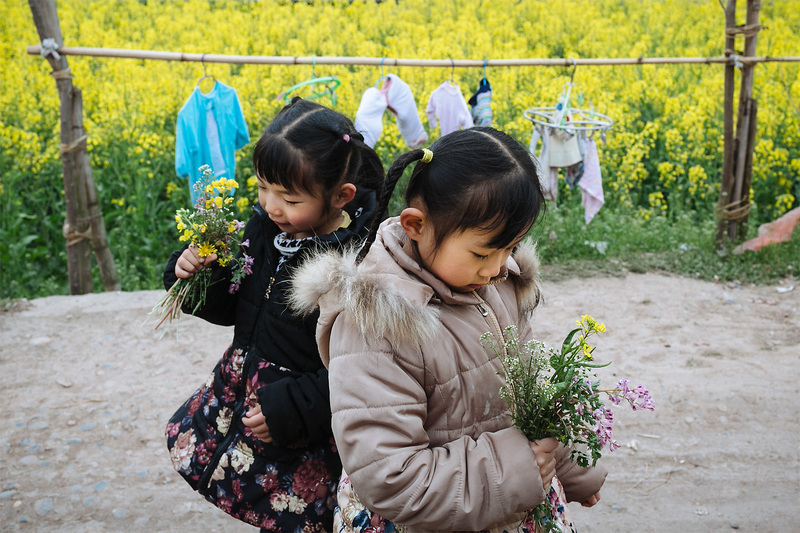 Sisters Mengmeng, four, and Siyao, six, pick wildflower bouquets beside a blooming rapeseed field in their hometown, Longjing village, Jintang county, Sichuan province, in March 2015. 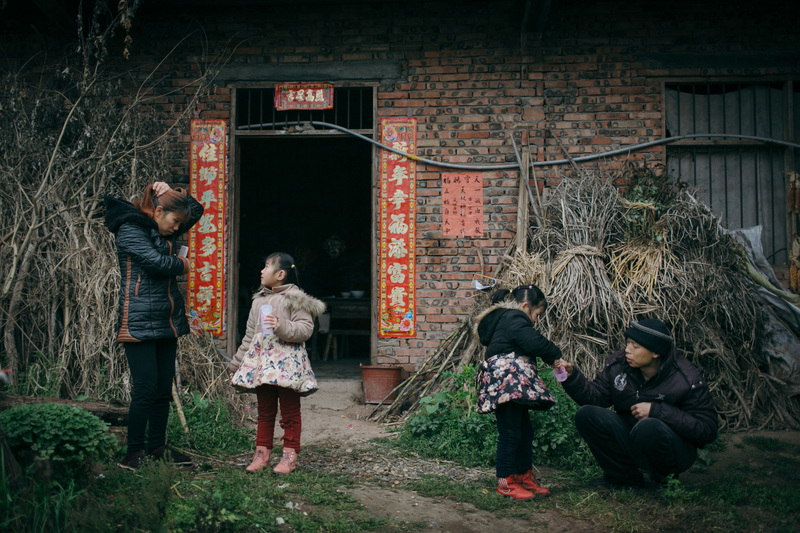 Four months earlier, after years of working in the coal mines, their father, Li Mingjin, was diagnosed with cancer. 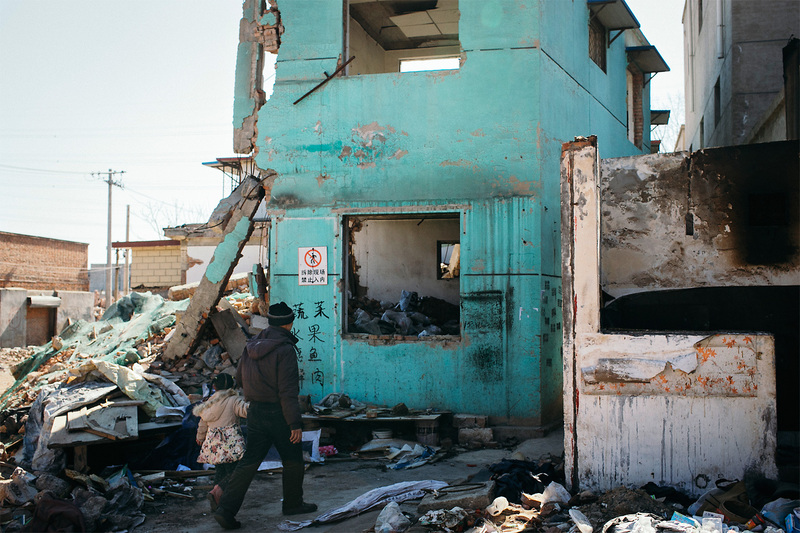 Li Mingjin and Siyao walk towards their dwelling in an area of Beijing in the midst of demolition, March 3, 2015. The family decided to come to Beijing for a course of trial chemotherapy. The risks are high, but the first four chemotherapy sessions were free. 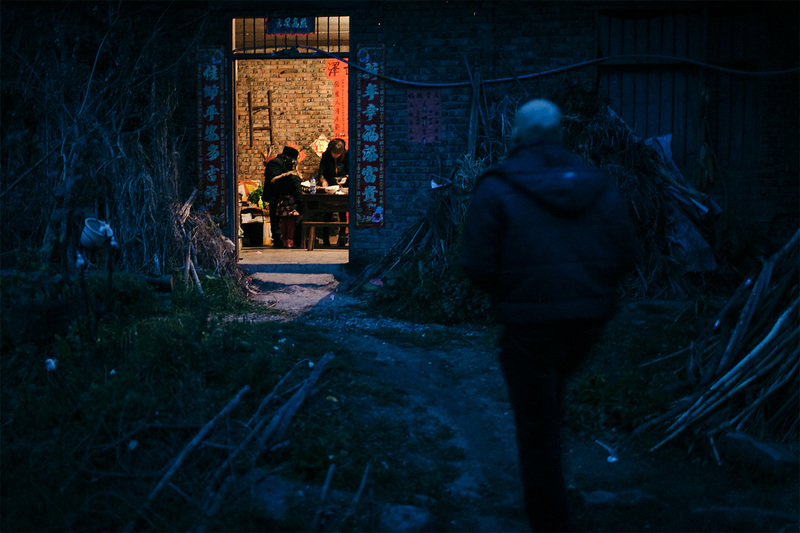 Li Mingjin walks toward his home as his 68-year-old mother and his wife prepare dinner, in Longjing village, March 5, 2015. According to Mingjin, he and his wife told his mother that his disease was not serious and could be easily treated. They wanted to prevent her from worrying too much. 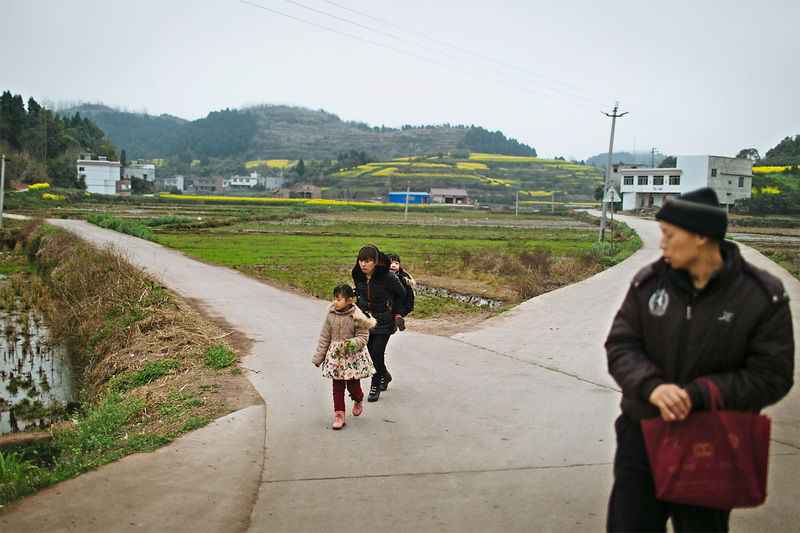 Li Mingjin looks at his wife, Ning Xianfang, and their two daughters as they walk towards home, in Longjing village, March 6, 2015. After Mingjin got sick, Xianfang had to take care of the whole family. She doesn’t have time to work and Mingjin is not able to work, so the family doesn’t have any income. Li Mingjin puts on his hat in front a mirror at home, in Longjing village. He shaved his head because of the chemotherapy. In winter, he feels cold without hair, so he always wears a hat. 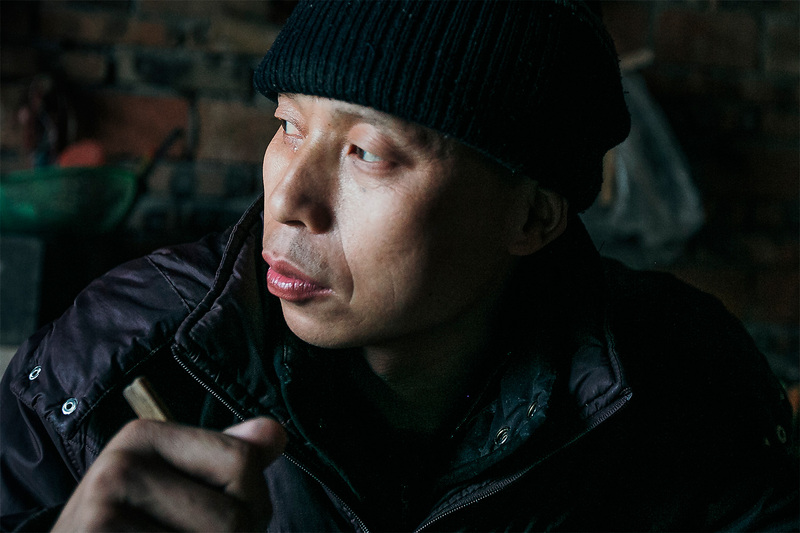 Mingjin had worked as a miner in Shanxi province for 19 years, but in November 2014 he was diagnosed with lung cancer. 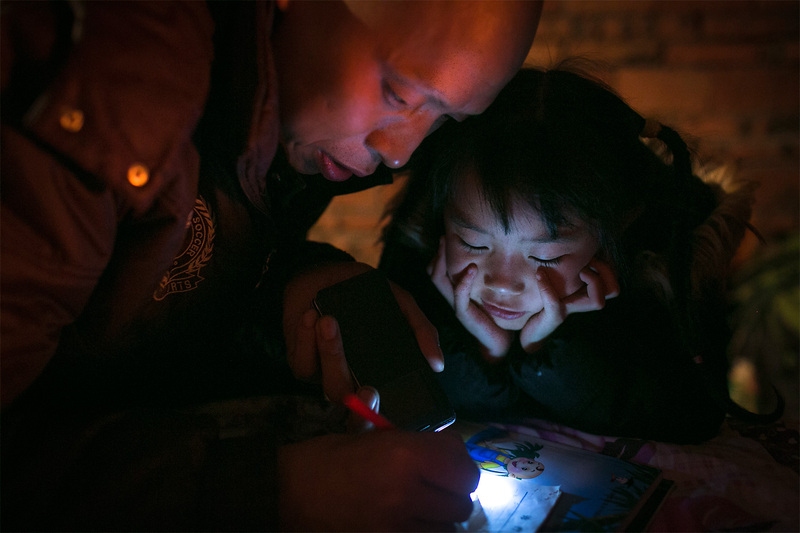 Unable to afford to send his daughters to school, Li Mingjin teaches Siyao writing at night by the light of his cellphone, at home, in Longjing village. 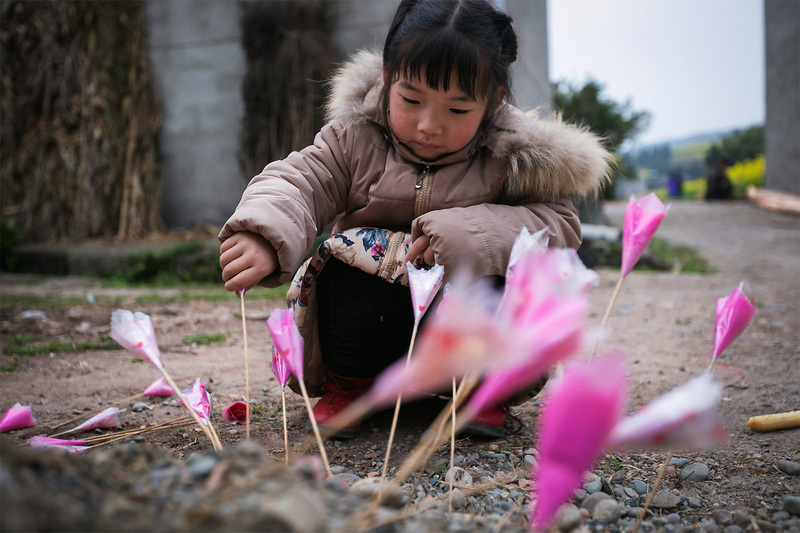 Mengmeng, four, sticks fake flowers into the ground in front her home, in Longjing village, March 5, 2015. She cries often. According to Ning Xianfang, she started talking when she was two years old. 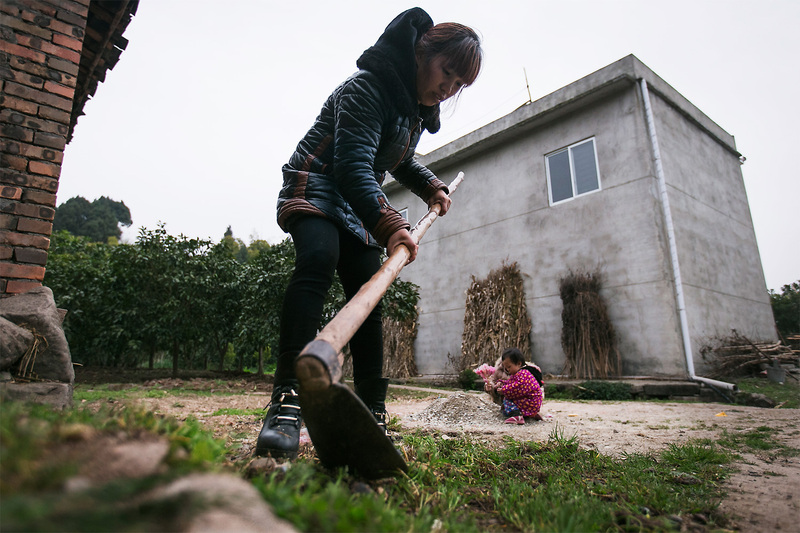 Ning Xianfang pulls weeds in front of her home, Longjing village, March 5, 2015. Li Mingjin’s mother has a seriously hunched back, so she can’t help much with chores. Ning Xianfang tries to comfort Li Mingjin. With no more money for treatment and unable to care for their daughters, the couple decided that the only thing left to do was to try to sell one of their daughters and hope for the best. 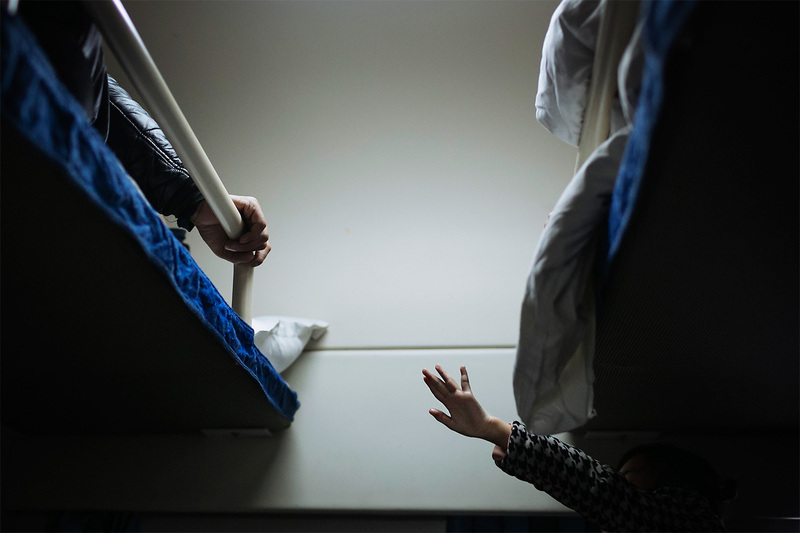 On a return train bound for Chengdu, Sichuan province, Siyao reaches out to her father to touch his hand as Li Mingjin lies on the bed gripping the edge tightly because of pain. Back in his home, Li Mingjin cries as he talks about his family situation during lunch, in Longjing village. 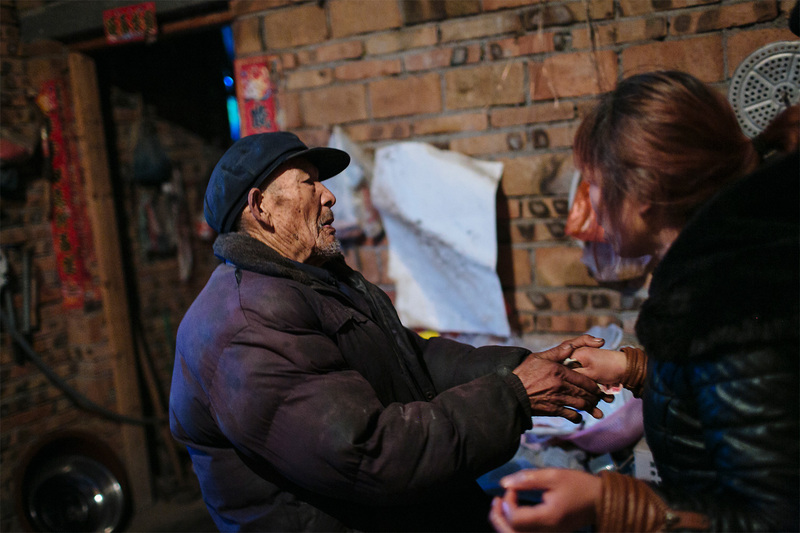 A village elder pays the family a visit and gives Ning Xianfang 160 renminbi (U.S.$25), nearly all of his 200 renminbi monthly income. The village cadres meet with Li Mingjin to ask about his situation and to see if there’s a way to help the family financially. 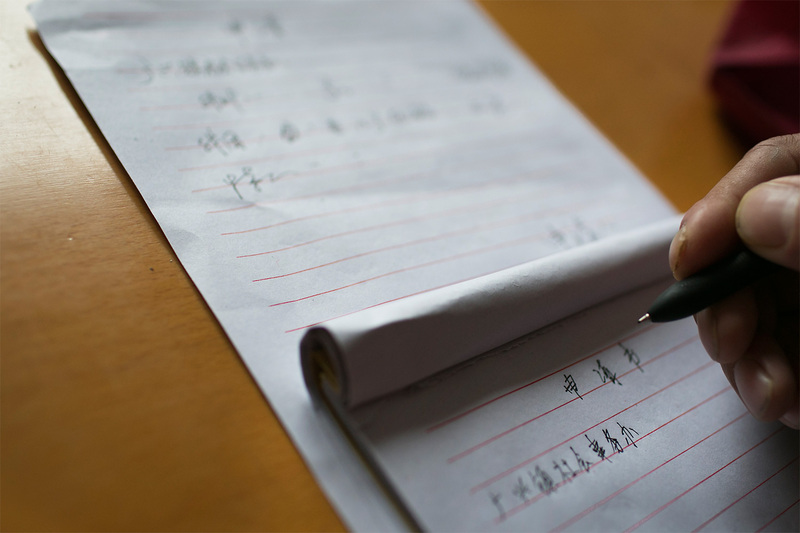 Li Mingjin writes an application letter to the local government for minimum living allowance. The process takes a couple of months. 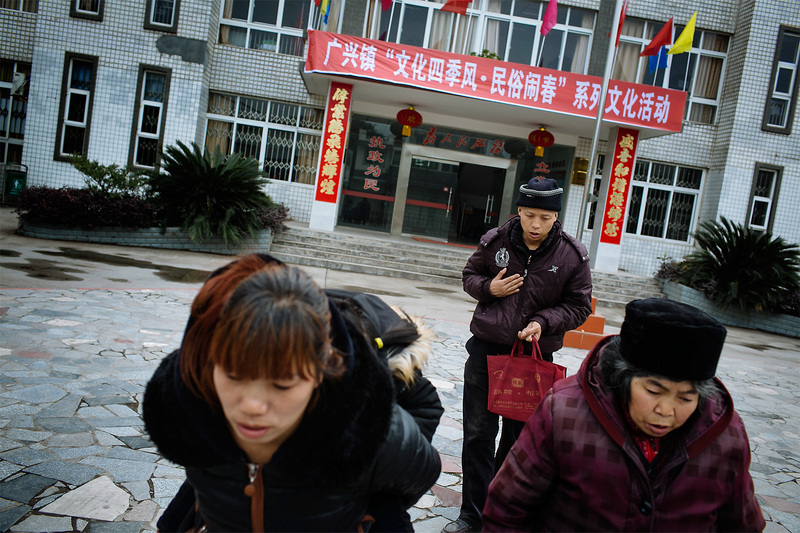 Li Mingjin and his family leave the local government offices, after a meeting to ask for financial help. The local government officials didn’t give a clear answer, saying instead that there are many cases like Li’s in the town. 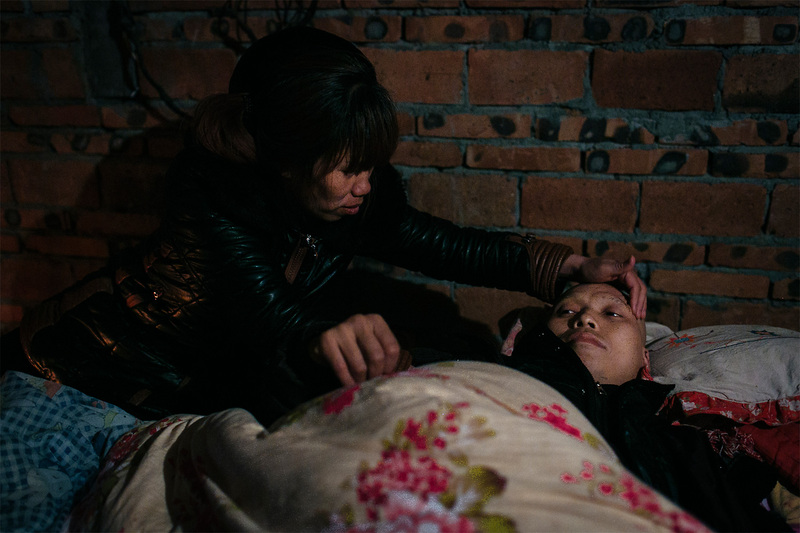 Siyao stands on her father’s back to give him a back massage to try to ease his pain. The family settles down for the night, unsure of what the future holds. Li Mingjin and Ning Xianfang feed their daughters breakfast while the children watch morning cartoons. 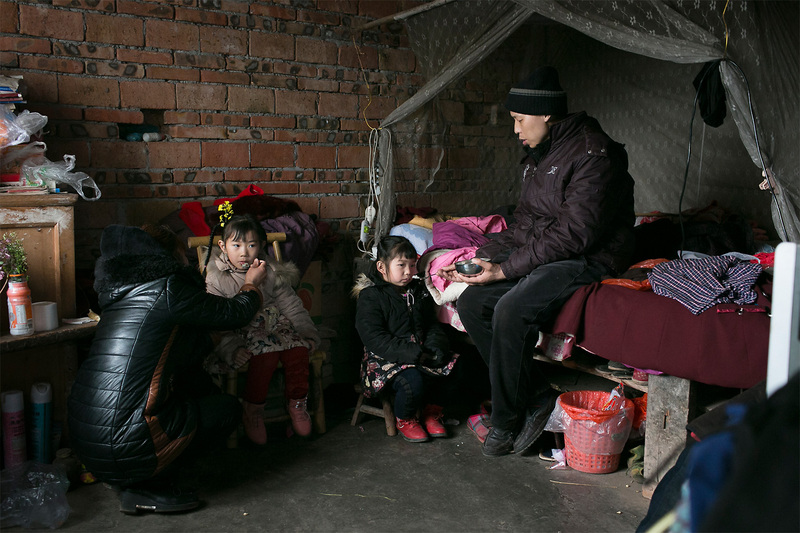 Li Mingjin and Ning Xianfang monitor and help Siyao and Mengmeng brush their teeth, in front of their home in Longjing village, March 6, 2015. 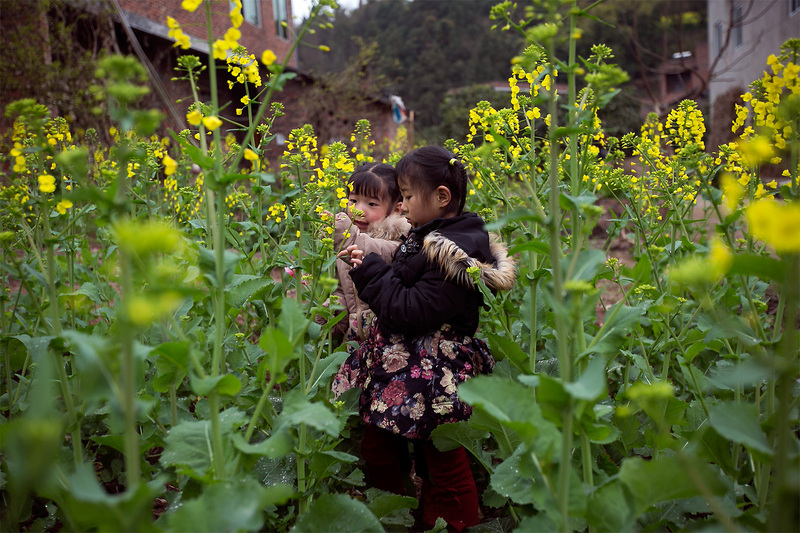 Siyao and Mengmeng play in a rapeseed field, in Longjing village, March 5, 2015. 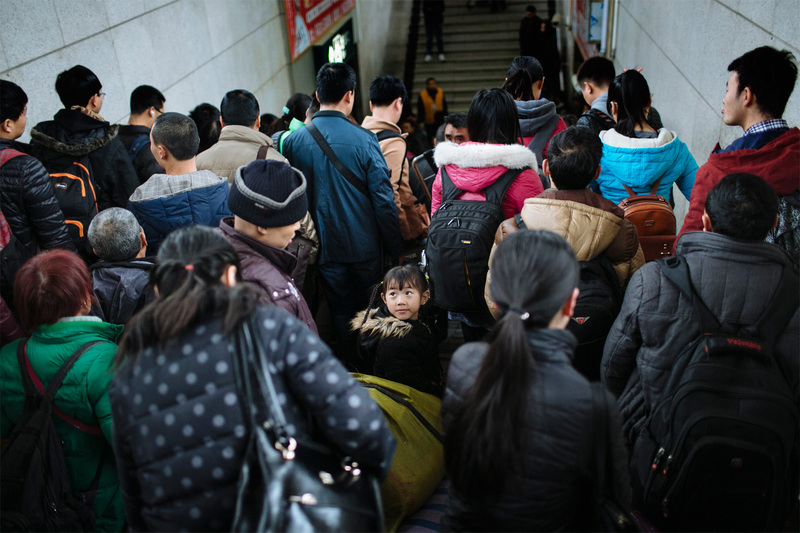 Siyao looks back at her father in the Chengdu train station as they return home from Beijing after he ended treatment, March 5, 2015. A version of this gallery was originally published in Chinese by Tencent QQ. 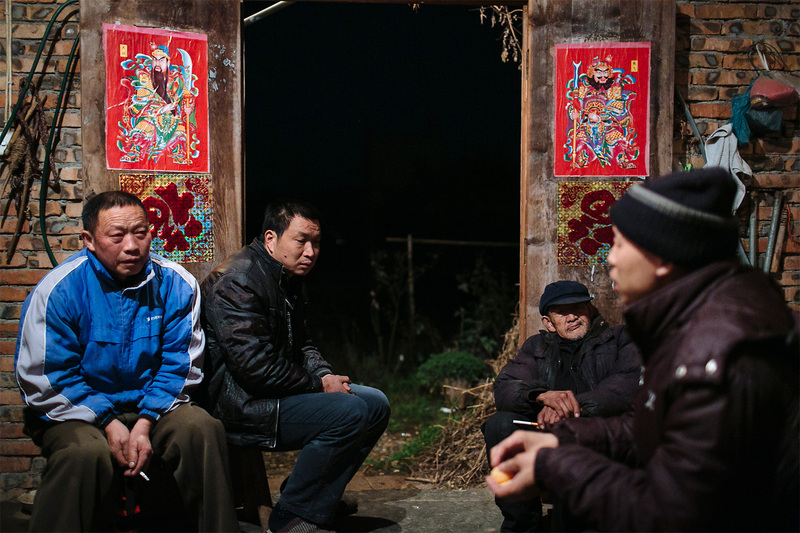 Li Mingjin, a 38-year-old coal miner, worked hard and was the sole breadwinner for his family. For 19 years, he toiled deep in the belly of the earth beneath Shanxi province. But in November 2014, by the time he was diagnosed with lung cancer, he was too sick to continue working. His wife, Ning Xianfang, was left to care for him and their two daughters, six-year-old Siyao and four-year-old Mengmeng. Without his employment or any form of health insurance (they had opted not to buy insurance from the government), the family’s economic situation quickly became dire. 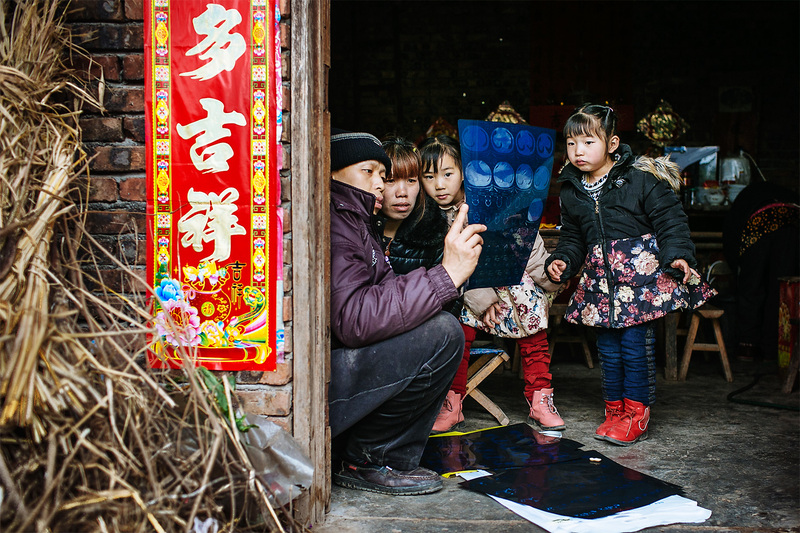 While working as a staff photographer for Tencent, I spent four days with Mingjin and his family and worried for what was in store for them, and we continued to be in touch thereafter. In November 2014, the family moved to the capital city of Beijing to seek better treatment for Mingjin. Their meager savings lasted only a month. To conserve the money they had borrowed from relatives and neighbors, Mingjin and Xianfang decided that he would volunteer for a trial treatment, which was risky but would cost less initially; the first four chemotherapy treatments were free. When he learned that he could save even more money by forgoing the medicine that protects one’s heart and liver during the trial, Mingjin decided to take the chance. The initial results were good. His tumor responded well to the first four treatments of chemotherapy and the mass shrunk by 5 millimeters during the trial period. However, even though the doctors recommended continuing treatment, Mingjin had to stop after the fourth dose because the family had run out of money. 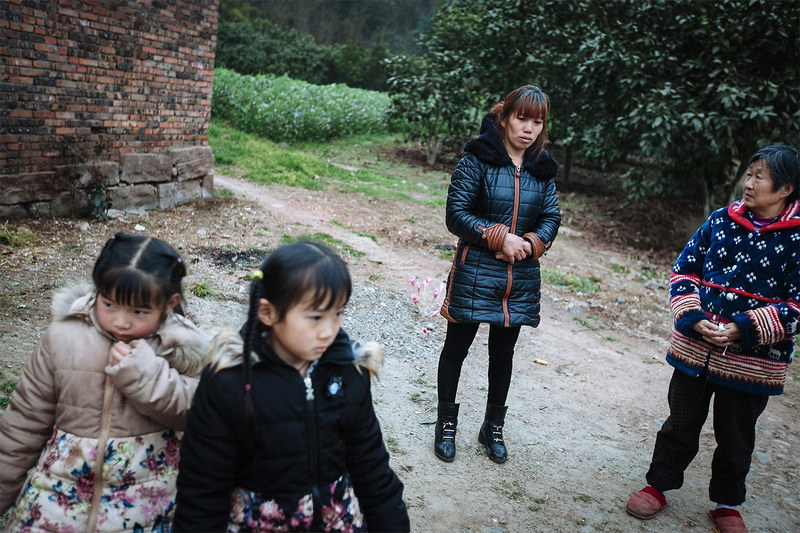 Without money to cover school fees, Siyao and Mengmeng had to drop out, but their family’s problems were only just beginning. By February 2015 they had run out of money to buy food and Mingjin and Xianfang were growing desperate. Far from home, the couple made an agonizing decision: So that everyone could survive, they decided to try to sell one of their daughters. 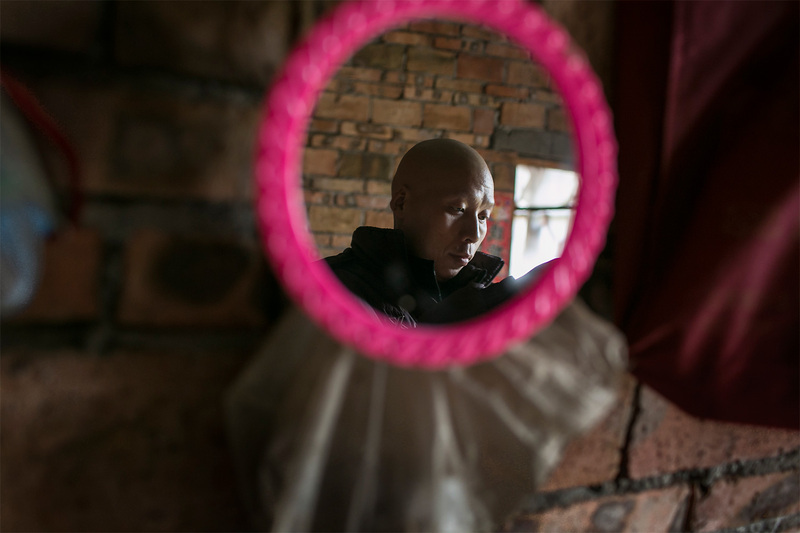 With some money, their other daughter could go to school, everyone would have food, and, maybe, Mingjin would have money for the cancer treatment. After this story was published in China by Tencent, the outlet ran a crowd-sourced fundraising campaign which raised 150,000 renminbi (U.S.$22,845) in donations in just six hours. With that money, Mingjin was able to continue treatment and the family stayed together. Mingjin’s daughters were able to go back to school. In the spring of 2016, Mingjin started to feel worse. He has not received treatment since the beginning of the year, because he used up all of the money from the fundraising campaign. Instead, he’s using inexpensive Chinese traditional medicine. Tencent won’t solicit more donations for the family because its campaigns are organized by a third party charity which Tencent told me declined to raise more funds because Mingjin’s family failed to provide valid receipts for their use of the money they received. The better news is that Mingjin’s two daughters are back in school, and Siyao is smart and just received a small scholarship that helps cover some of her school expenses. Because the kids are back in school in their hometown and because Mingjin’s elderly mother’s health is not good, making her mostly homebound, Xianfang told me they do not want to return to Beijing for treatment.